Product prices and availability are accurate as of 2019-04-20 09:32:55 UTC and are subject to change. Any price and availability information displayed on http://www.amazon.com/ at the time of purchase will apply to the purchase of this product. Arrow Lock aluminum enamel finish rim exit device. The Arrow S1250 Rim Exit Device offers a reliable and dependable solution at a price you can afford. Certification: ANSI/BHMA A156.3, Grade 1. Underwriters Laboratories (UL and CUL) listed for accident hazard (panic) standard. 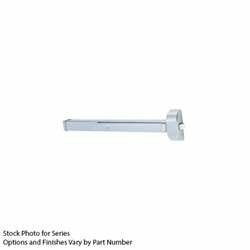 Fire Exit hardware for hollow metal doors, UL and CUL listed for 3 hour, A label and lesser doors, Prefix "F" before part number. ANSI A117.1 Accessibility Code. Fire Exit Hardware for wood doors, listed up to 1-1/2 hour, B label doors. All exit devices comply with life safety code NFPA 101. All fire rated devices comply with fire door and window code NFPA80. Chassis and Cover: Non-ferrous alloy. End caps: metal. Doors: 1-3/4-inches thick. Hollow metal. 4-1/2-inches minimum stile. Handling: Non-handed. Dogging: Allen-type key standard, cylinder available. Top/Bottom Bolts/Latchbolt: 3/4-inches throw, stainless steel. Through bolts: Order separately. Rail Assembly: Steel. Rail furnished standard for doors up to 36-inches, can be cut down to accommodate 32-inches doors.